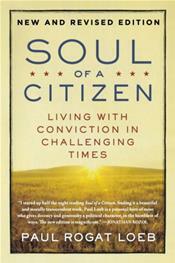 Soul of a Citizen awakens within us the desire and the ability to make our voices heard and our actions count. We can lead lives worthy of our convictions...Soul of a Citizen has become the handbook for budding social activists, veteran organizers, and anybody who wants to make a change?big or small?in the world around them. At this critical historical time , Paul Loeb's completely revised edition?and inspiring message?is more urgently important than ever.